The incident was one of two that happened in December 2011 at a site in South Road, Saffron Walden. Both were investigated by the Health and Safety Executive (HSE) which, on 6 December, prosecuted McCarthy & Stone Retirement Lifestyles Ltd.
Chelmsford Crown Court heard that the company employed its own team of crane erectors for a project to construct new retirement apartments on the site. 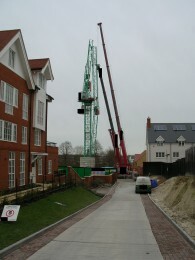 A 24 metre tall tower crane, which had a 45 metre long jib, was installed in early December 2011. The court heard that on 15 December crane erectors were carrying out a test lift when the lifting rope broke, causing a heavy block and seven tonne test load to fall onto a trailer. No one was injured but witnesses described how the crane and jib recoiled violently, bucking back and forth. A new lifting rope was installed, but the crane remained unused pending the delivery of a new “load indicator” rope. But two days before Christmas, on 23 December, the crane’s jib collapsed, causing the 280kg hook block to swing and fall outside the boundary of the construction site. The heavy steel block broke in two, partly demolishing a garage and fence belonging to a neighbouring developer. The bent jib was left hanging vertically from the top of the tower crane. Fortunately, both construction sites had closed for the Christmas break and no one was injured. However, emergency services evacuated 30-40 residents from nearby homes while the area was made safe. Those evacuated were able to return home for Christmas Day. HSE found that safety-critical high-tensile steel bolt connections had not been suitably installed and maintained in the crane jib. Evidence indicated that the correct pre-tension torque was not applied to tighten these vital components and that no suitable lubrication regime was implemented. The crane had been subjected to damage in the first incident, when the lifting rope failed. Clearly, at this point, the company could have ensured that a thorough mechanical examination of the crane was carried out, but it failed to do so. In fact, little more than a visual examination was carried out and the crane later collapsed after the connecting components in the lower jib failed in tension. McCarthy & Stone Retirement Lifestyles Ltd., of Homelife House, Oxford Road, Bournemouth, was fined a total of £50,000 including a victim surcharge and ordered to pay £47,681 in costs after pleading guilty to breaching Sections 2 and 3(1) of the Health and Safety at Work etc. Act 1974 at an earlier hearing.